Interactions between dendritic cells (DC) and T cells are known to involve the delivery of signals in both directions. We sought to characterize the effects on human DC of contact with different subsets of activated CD4+ T cells. The results showed that interaction with CD25highCD4+ regulatory T cells (Tregs) caused DC to take on very different properties than contact with naive or memory phenotype T cells. Whereas non-Tregs stimulated DC maturation, culture with Tregs produced DC with a mixed phenotype. By many criteria, Tregs inhibited DC maturation, inducing down-regulation of costimulatory molecules and T cell stimulatory activity. However, DC exposed to Tregs also showed some changes typically associated with DC maturation, namely, increased expression of CCR7 and MHC class II molecules, and gained the ability to migrate in response to the CCR7 ligand CCL19. Both soluble factors and cell-associated molecules were shown to be involved in Treg modulation of DC, with lymphocyte activation gene 3 (LAG-3) playing a predominant role in driving maturation-associated changes. The data show that Tregs induce the generation of semimature DC with the potential to migrate into lymphoid organs, suggesting a possible mechanism by which Tregs down-modulate immune responses. The central role of dendritic cells (DC)4 in controlling immunity is linked to the ability of these cells to modify their properties in response to external stimuli. In general, DC are considered to switch from an immature state, in which they are adept at Ag capture but are poor stimulators of T cells, into a mature state, in which they are potent T cell activators (1). This is associated with two contrasting functions of DC: the maintenance of self-tolerance through abortive stimulation of T cells by immature DC and the induction of immune responses via the productive activation of T cells by mature DC (2). DC maturation involves multiple alterations, including changes in Ag processing/presentation and expression of MHC molecules, costimulatory molecules, cytokines, and chemokines, which affect their ability to attract and regulate the differentiation and activation of T cells. The expression of chemokine receptors on DC also changes following the receipt of maturation-inducing stimuli, shifting from receptors specific for chemokines expressed in peripheral tissues to those recognizing chemokines produced in secondary lymphoid organs (3, 4). Up-regulation of CCR7, a receptor for CCL19 and CCL21, has been shown to be crucial for the migration of DC from peripheral tissues into T cell areas of draining lymph nodes in response to inflammation (5, 6). Different classes of stimuli have been shown to modulate the properties of DC. One of these is infection, to which DC can respond either directly or indirectly. Direct responses to infectious agents are mediated by DC-expressed innate receptors, such as the members of the TLR family, which recognize conserved features of pathogens and can initiate signals for maturation (7). Indirect, infection-induced signals that influence DC behavior include cytokines as well as molecules released by dying cells (8, 9, 10). A second type of stimulus that is well established for its influence on DC is that mediated by contact with T cells. Thus, presentation of Ag to specific T cells not only initiates signaling in the T cells, but also results in the delivery of signals to the APC. The reciprocal stimulation of DC by T cells appears to be required for the development of DC with full T cell stimulatory activity, at least in the context of some types of immune responses. For example, prior interaction with CD4+ T cells generates DC that are competent for the induction of CD8+ T cell responses by cross-priming, a process referred to as “DC licensing” (11, 12). CD4+ T cells have also been shown to influence the quality of immune response that DC elicit. In one report, DC pre-exposed to TH3 phenotype memory T cells were shown to induce a similarly polarized response when subsequently used to stimulate naive T cells (13). Modulation of DC function in this way, which the authors called “DC education”, was dependent on IL-4, IL-10, and some other undefined factor(s) produced by the memory T cells. Conversely, DC licensing for cross-priming was shown to be mediated by CD40 ligand (CD40L), which is expressed on activated T cells and delivers signals to the DC through the cross-linking of CD40 (14). Although CD40L-CD40 interaction is the best-characterized T cell-mediated DC maturation stimulus, a variety of other DC cell surface molecules possessing ligands on activated T cells have been demonstrated to deliver signals to DC. In addition to cytokine and chemokine receptors, these include MHC class II, TNF-related activation-induced cytokine receptor, Fas, CD80, and CD86 (15, 16, 17, 18, 19). As suggested by the studies on DC “education,” the way in which interactions with T cells affect DC will depend on the properties of the specific T cells involved. In this respect, understanding how DC function is influenced by contact with regulatory T cells (Tregs) is important. Naturally occurring CD25+CD4+ Tregs have been shown to play a key role in down-modulating immune responses, contributing both to the maintenance of self-tolerance and to prevention of excessive responses against infection (20). Tregs inhibit the proliferation and cytokine production by conventional T cells, and a deficiency of these cells is associated with autoimmunity in mice and humans (20, 21, 22, 23, 24, 25). The way in which Tregs suppress immune responses remains a subject of debate. Studies of Treg activity in vitro have generally indicated that suppression of T cell responses requires direct cell-cell contact, but soluble factors, particularly TGF-β and IL-10, have also been implicated in Treg activity (26). Moreover, Tregs may act on multiple target cells. Thus, while some studies suggest that Tregs can act directly on responding T cells (27), there is evidence that effects of Tregs on DC are also important (26). Most notably, recent work in which adoptively transferred Tregs were visualized in the lymph nodes of mice revealed that Tregs formed stable associations with DC, which prevented subsequent strong interactions between DC and autoreactive CD25−CD4+ TH cells (28). Significant contact between Tregs and TH cells was not observed, implying that DC may be the most relevant targets of Tregs in vivo. In addition, there is evidence from in vitro studies that Tregs can inhibit some aspects of DC maturation (29, 30, 31, 32, 33), although the overall consequences of Treg-DC interaction are incompletely understood. We have compared the effects on human monocyte-derived DC of interactions with different subsets of CD4+ T cells. The results show that Tregs and non-Tregs elicit distinct changes in DC. Whereas non-Tregs stimulate classical DC maturation, Tregs cause DC to exhibit a mixed phenotype that includes down-regulation of costimulatory molecules but up-regulation of CCR7 and MHC class II. The mechanisms involved in Treg modulation of DC function were investigated, and the implications of Treg-induced semimature DC are discussed. Recombinant human GM-CSF was obtained from Immunotools. IL-2, IL-4, CCL4, CXCL12, CCL19, CD40L trimers, isotype control mouse IgG, neutralizing mAbs to IL-10 and TGF-β, anti-CD3 mAbs, anti-CD28 mAbs, and allophycocyanin-conjugated mAbs to CCR5, CCR7, and CCR8 were purchased from R&D Systems. Fluorochrome-conjugated Abs to CD3, CD1a, CD69, CD40L, CD83, HLA-DR, CD80, CD86, CD40, CD45RO, CD45RA, CD25, CD4, CTLA-4, CD62L, CCR4 and CXCR4, and isotype control Abs were obtained from BD Pharmingen. FITC-anti LAG-3 was purchased from Alexis Biochemicals and PE-anti-human FoxP3 was obtained from eBioscience. Blocking Abs to human CD152 (CTLA-4) were obtained from Ancell. Blocking mAbs to LAG-3 (17B4) were a gift from Immutep. PBMC were isolated from buffy coats, purchased from the North London Blood Transfusion Centre, by Ficoll-Hypaque density gradient centrifugation. Ethical approval for use of this material was obtained from the Compton Human Subjects Committee. Monocytes were positively isolated using CD14 beads (Miltenyi Biotec). Immature DC were generated by culturing monocytes for 7 days in RPMI 1640 containing 10% FCS, 50 U/ml penicillin, 50 μg/ml streptomycin, IL-4 (500 IU/106 cells), and GM-CSF (1000 IU/106 cells). One-half of the medium, including all supplements, was replaced every 2 days. The immature DC demonstrated a high expression level of CD1a and CCR5, medium expression level of HLA-DR, CD80, and CD86, and were negative for CD83 (data not shown). For induction of DC maturation by TLR agonists, day 6 DC were stimulated with poly(I:C) (10 μg/ml/0.5 × 106 cells) for 24 h. DC were washed extensively with RPMI 1640/10% FCS before further culture. TLR-stimulated DC showed a mature phenotype with high expression levels of HLA-DR, CD80, CD86, CCR7, and the DC maturation marker CD83 (data not shown). CD4+CD45RO+ T cells were purified from PBMC by negative selection using a kit from Dynal Biotech. CD4+CD45RO+CD25high Tregs were isolated from purified CD4+CD45RO+ T cells by positive selection using CD25 beads. The flow-through population, depleted of CD25high cells but not CD25low cells, was used for comparison to Tregs. Purified CD4+CD45RO+CD25high Tregs represented 0.86% of PBMC (range, 0.55–1.6%, n = 17) and 4.4% of CD4+CD45RO+ T cells (range, 1.6–10.4%). CD4+CD45RA+ T cells were isolated from PBMC by a two-step negative selection process, involving initial purification of CD4+ T cells and subsequent depletion of CD45RO+ T cells using CD45RO beads (Miltenyi Biotec). The purity of the various T cell subsets was >95% (data not shown). Day 7 DC were cultured in medium containing GM-CSF and IL-4 or were cocultured with T cell subsets at a 1:5 ratio for 72 h. T cells from allogeneic donors were added to DC without prior activation. Autologous T cells were prestimulated with immobilized anti-CD3 mAbs (1 μg/ml) for 24 h. T cells were deleted from DC-T cell cocultures using CD3 beads (Miltenyi Biotec). CD4+ T cells were isolated by negative selection using a kit from Miltenyi Biotec and labeled with CFSE (0.2 μl of 5 mM for 10 × 106 cells) for 5 min at 37°C. After quenching the labeling reaction by addition of 4% FCS-PBS, the cells were washed extensively. CFSE-labeled responder CD4+ T cells (1 × 105 cells/200 μl/well) were cultured with purified DC (1 × 104 cells) in round-bottom 96-well plates for 96 h in X-vivo 15 medium (Cambrex). To avoid the effect of FCS on the stimulation of T cells, we used FCS-free culture condition in the proliferation assay. T cell proliferation was determined by CFSE dilution analysis on a FACSCalibur (BD Biosciences). Migration of DC was measured by chemotaxis through a 5-μm pore polycarbonate filter in 24-well Transwell chambers (Costar). One hundred nanograms of CCL4, CXCL12, or CCL19 per ml was placed in the lower chambers in a 600-μl volume and 100 μl of DC were placed in the upper chambers at a concentration of 4 × 106/ml. After 2 h of incubation at 37°C, migration of DC was assessed by counting the cells in the lower chamber. To calculate the chemotactic index, the number of cells that migrated in the presence of chemokines was divided by the number of cells migrating in medium alone. Cytokines were quantified in cell-free culture supernatants using BD CBA Human Inflammation and Th1/Th2 Cytokine kits (BD Biosciences). Statistical significance was determined using the Mann-Whitney U test. We initially characterized the effects on DC of contact with three phenotypically defined subsets of CD4+ T cells: Tregs, naïve phenotype T cells, and memory phenotype T cells, each of which were isolated from the peripheral blood of healthy donors. Tregs, which are enriched among CD25highCD45RO+CD4+ T cells (34, 35, 36, 37, 38, 39, 40), were extracted from purified CD4+CD45RO+ T cells by positive selection of CD25high cells. The residual, CD25high-depleted CD4+CD45RO+ T cells were used as a source of enriched memory cells (hereafter referred to as RO cells). CD4+CD45RO− (CD45RA+) T cells were purified separately and represented an enriched naive T cell population (hereafter called RA cells). The isolated CD45RO+CD25highCD4+ T cells were shown by intracellular FACS staining to express the transcription factor forkhead box P3 (FoxP3), whereas RO and RA T cells were essentially negative for FoxP3 expression (data not shown), consistent with the former cell population being enriched for Tregs. Moreover, these Tregs failed to proliferate after stimulation with anti-CD3 and anti-CD28 mAbs and suppressed the proliferation of cocultured conventional T cells in a dose-dependent manner (data not shown). T cells were cocultured with immature monocyte-derived DC for 3 days, and the expression of various cell surface molecules was examined (Fig. 1⇓). The DC and T cells were from unrelated donors so that presentation of alloantigens served as a stimulus for T cell activation; essentially identical results were observed when T cells were preactivated by anti-CD3 Abs and mixed with autologous DC (data not shown). DC cultured in the absence of T cells (but with GM-CSF and IL-4 to prevent reversion to a monocyte/macrophage phenotype (32)) were analyzed for comparison. Tregs differentially regulate DC maturation. A and B, Immature DC (day 7) were cultured alone (none) or cocultured with allogenic Tregs, RO T cells, or RA T cells at a 1:5 ratio for 72 h. DC were purified from DC-T cell cocultures and analyzed for the expression of surface markers. The percentage of cells expressing the indicated markers is shown in A, while mean fluorescence intensities (MFI) are shown in B. Results are expressed using a box and whisker plot, in which boxes represent the interquartile range of data between the 25th and 75th percentiles, whiskers represent the upper and lower limits of the data, and the dividing line in the box represents the median. Results from up to 13 donors are presented. Statistical significance (∗, p < 0.05), as determined by the Mann-Whitney U test, is indicated. C, Immature DC were cultured alone or cocultured at a 1:5 ratio with allogeneic Tregs, RO T cells, or T cells containing different proportions of Tregs and RO T cells. After 72 h of coculture, DC were analyzed for the expression of CD80 (□) and CD86 (▪). The results represent the mean ± SD for two independent donors. Following culture with RO or RA T cells, DC exhibited phenotypic changes indicative of maturation, including increased surface expression of CD80, CD86, HLA-DR, and CCR7 (Fig. 1⇑, A and B). No significant differences were observed between the effects of RO and RA cells. Conversely, a distinct phenotype was observed for DC that had been cultured with Tregs. Expression of costimulatory molecules CD80 and CD86 was much lower than on DC cultured with RA or RO cells and was actually lower than on DC cultured in medium alone. In addition, the expression of certain chemokine receptors on DC was differentially modulated by Tregs vs non-Tregs. Unlike RA and RO cells, Tregs induced up-regulation of CCR5 and CCR8, which are typically associated with immature DC (Fig. 1⇑A). Interestingly, however, some aspects of the phenotype exhibited by Treg-conditioned DC did not fit with what is typical of immature DC. In particular, Tregs induced greater up-regulation of some chemokine receptors associated with DC maturation, namely, CCR7 and CXCR4 (3, 4), than did the non-Treg populations. In addition, interaction with Tregs caused increased expression of HLA-DR on DC (Fig. 1⇑B). Therefore, interaction with activated Tregs caused immature DC to take on some phenotypic characteristics of mature DC. Similar results were observed when Tregs were preactivated and mixed with autologous DC (data not shown). We further investigated whether Tregs could modulate the properties of DC when non-Tregs were also present. Immature DC were cultured alone, with Tregs, with RO T cells, or with the two T cell types mixed at different ratios (Fig. 1⇑C). Analysis of CD80 and CD86 expression on the DC after culture with T cells showed that the down-regulation of costimulatory molecules varied inversely with the ratio of Tregs:non-Tregs. Notably, even at a ratio of 1:16, the presence of Tregs reduced the up-regulation of CD80 and CD86 stimulated by RO T cells; when cultured with these cells at a 1:8 ratio, DC expression of the costimulatory molecules was lower than on DC cultured in medium alone. Thus, Tregs can influence DC maturation even when they represent a low proportion of total T cells. Overall, the data imply that the outcome of DC-T cell interaction under physiological conditions will depend on the relative level of presentation of Ag to (and subsequent activation of) Tregs vs non-Tregs; this could vary with both the specific peptides presented and the composition of T cell subsets at a given anatomical site. To determine whether contact with different activated T cell subsets induced functional differences in DC, we first assessed the production of cytokines in the DC-T cell cocultures. Three days after combining DC and T cells, supernatants were analyzed for the presence of various cytokines (Fig. 2⇓, A and B). As expected, T cell-derived cytokines (IL-2, IL-4, IL-5, TNF-α, and IFN-γ) were present in cocultures containing RO or RA T cells (Fig. 2⇓B). These were essentially absent in Treg-DC cocultures, further confirming the hyporesponsive phenotype of these cells. Notably, several DC-associated cytokines, including IL-12, IL-1, IL-10, IL-6, and IL-8, were produced in greater amounts when DC were cultured with RO and RA cells than with Tregs (Fig. 2⇓A). Compared with cultures of DC alone, only IL-10 (which may be produced by either DC or T cells) was secreted in higher concentrations when Tregs were present. These data provide additional evidence that Tregs are deficient in stimulating DC maturation. Tregs modulate immature DC function. A and B, Effect of coculture of DC with T cells on the secretion of DC (A) and T cell (B)-cytokines. Immature DC were cultured alone (none) or cocultured with allogeneic Tregs, RO T cells (RO), or RA T cells (RA) at a 1:5 ratio for 72 h. Supernatants from the cocultures were assayed for the indicated cytokines. Results from up to eight donors are presented. Data are represented by box and whisker plots. Statistical significance (∗, p < 0.05), as determined by the Mann-Whitney U test, is indicated. C, Effect of preculture with T cells on the T cell stimulatory ability of DC. Immature DC were cultured alone (left panel) or cocultured with allogeneic Tregs (right panel) or RO T cells (middle panel) at a 1:5 ratio. After 72 h, DC were purified and examined for their ability to stimulate the proliferation of CFSE-labeled allogeneic (third-party) CD4+ T cells; purified DC were cultured with CFSE-labeled CD4+T cells at 1:10 ratio for 96 h. The percentage of responder T cells that underwent one or more cell divisions is indicated. D, Effect of preculture with T cells on chemokine responsiveness of DC. Immature DC were cultured alone (▦) or cocultured with allogeneic Tregs (▪) or RO T cells (□) at a 1:5 ratio for 72 h. DC were purified from DC-T cell cocultures and migration in response to CCL4, CXCL12 and CCL19 (100 ng/ml) was measured. Data represent mean ± SD for two donors. Functional maturation of the conditioned DC was further assessed by measuring their ability to stimulate T cell proliferation. DC were purified from DC-T cell cocultures and added to CFSE-labeled third-party CD4+ T cells (Fig. 2⇑C). As expected, immature DC that had been precultured in medium alone elicited minimal T cell proliferation (93% of T cells had not divided after 4 days). DC that had been pre-exposed to RO T cells were more effective T cell stimulators (62% undivided cells). However, Treg-conditioned DC failed to induce T cell proliferation (95% undivided cells). Thus, the ability of the DC to stimulate T cell proliferation correlated with their expression of costimulatory molecules. The relevance of changes in chemokine receptor expression was assessed by measuring the migration of T cell-conditioned DC in response to three chemokines: CCL19, CXCL12, and CCL4, which act through CCR7, CXCR4, and CCR5, respectively. Again, the functional capacities of the DC matched their phenotypes (Fig. 2⇑D). Compared with DC precultured in medium alone, DC that had been pre-exposed to either RO T cells or Tregs exhibited a substantial increase in their migratory response to CXCL12, consistent with the up-regulation of CXCR4 in both cases. Both types of DC also showed enhanced migration in response to CCL19, although a much stronger response was exhibited by Treg-conditioned DC. Conversely, increased migration to the CCR5 ligand CCL4 was observed only for DC that had been precultured with Tregs (Fig. 2⇑D), in accordance with CCR5 up-regulation on Treg- but not RO-conditioned DC (Fig. 1⇑A). During the course of an immune response, full maturation of DC is likely to involve a two-step process: initial stimulation by an infection-associated signal and subsequent triggering by activated T cells (41). To investigate how different T cell subsets affect DC that have received the first of these signals, DC were treated for 24 h with polyinosinic polycytidylic acid (poly I:C), an agonist of TLR3 and inducer of DC maturation (42), before coculture with T cells. As shown in Fig. 3⇓, A and B, addition of RA or RO cells to the poly(I:C)-treated DC had relatively minor effects on expression of maturation markers. Small increases in CCR7 and CD86 were observed, while the expression of most markers remained unchanged compared with DC cultured in medium alone. Conversely, DC cultured with Tregs had a significantly lower expression of CD80 and CD86 and higher expression of CCR5 than either DC cultured alone or DC cultured with RA or RO cells. Thus, Tregs were able to exert an inhibitory effect on DC maturation after these cells had been exposed to a TLR3 agonist. Very similar results were observed when LPS (a TLR4 agonist) was used as the DC maturation signal (data not shown). Interestingly, as with immature DC, poly(I:C)-treated DC expressed significantly higher levels of CCR7 after coculture with Tregs than after exposure to RO T cells or when cultured in medium alone (Fig. 3⇓A). Tregs modulate the phenotype and function of poly(I:C)-treated DC. A, DC induced to mature by treatment with poly(I:C) (10 μg/ml/0.5 × 106 cells for 24 h) were washed and cultured alone (none) or cocultured with allogeneic Tregs, RO T cells, or RA T cells at a 1:5 ratio for 72 h. DC were purified from DC-T cell cocultures and analyzed for the expression of surface markers. The percentage of cells expressing the indicated markers are shown in A, while mean fluorescence intensities are shown in B. Data are represented by box and whisker plots as described in Fig. 1⇑. Results from up to 6 donors are presented. Statistical significance (∗, p < 0.05), as determined by the Mann-Whitney U test, is indicated. C and D, Effect of coculture of poly(I:C)-treated DC with T cells on the secretion of DC (C) and T cell (D)-cytokines. Poly(I:C)-treated DC were cultured alone (none) or cocultured with allogeneic Tregs, RO T cells, or RA T cells at a 1:5 ratio for 72 h. Supernatants from the cocultures were assayed for the indicated cytokines. Results from up to five donors are presented. Statistical significance (∗, p < 0.05), as determined by the Mann-Whitney U test, is indicated. To further characterize the effects of Tregs on TLR-stimulated DC, cytokines were measured in the supernatants of the cocultures (Fig. 3⇑, C and D). As observed for immature DC, T cell-derived cytokines were detected in cultures containing RO or RA T cells but not Tregs (Fig. 3⇑D). In addition, culture of RA or RO cells with poly(I:C)-treated DC further stimulated the secretion of IL-6, IL-8 (with RO cells only), and IL-10, while IL-12 and IL-1 remained unchanged compared with DC cultured in medium alone (Fig. 3⇑C). Conversely, only IL-10 was secreted in significantly higher concentrations when Tregs were present, providing further evidence that Tregs are deficient in stimulating TLR-matured DC. To investigate how interaction with the T cell subsets affected the function of TLR agonist-stimulated DC, DC were purified from the DC-T cell cocultures and tested for their ability to stimulate third-party allogeneic CD4+ T cells (Fig. 4⇓). Poly(I:C)- treated DC that had been precultured in medium alone were able to induce some T cell proliferation (33% divided), and very similar results were observed when Treg-pretreated DC were used as APC (38% divided, Fig. 4⇓A). Conversely, much higher proliferation was induced by DC that had been precultured with RO cells (82%), indicating that these cells had further promoted the maturation of the poly(I:C)-treated DC. Thus, by this criterion, Tregs failed to enhance the T cell stimulatory activity of DC, but they did not reduce this activity compared with DC that were not conditioned by T cells. Tregs do not enhance the T cell stimulatory ability of poly(I:C)-treated DC. A, DC induced to mature by treatment with poly(I:C) (10 μg/ml/0.5 × 106 cells for 24 h) were washed and cultured alone (none, left panel) or cocultured with allogeneic Tregs (middle panel) or RO T cells (right panel) at a 1:5 ratio. After 72 h of coculture, DC were purified and examined for their ability to stimulate the proliferation of CFSE-labeled allogeneic (third-party) CD4+ T cells; purified DC were cultured with CFSE-labeled CD4+T cells at 1:10 ratio for 96 h. The percentage of responder T cells that underwent one or more cell divisions is indicated. B, Supernatants from the third-party T cell stimulation cultures were assayed for the presence of the indicated cytokines. Data represent mean ± SD for two donors. We also measured the quantities of multiple cytokines present in the secondary DC-T cell cocultures (Fig. 4⇑B). Preculture of DC with RO cells led to altered production of several cytokines compared with preculture of DC in medium alone. This included increases in IL-6, TNF-α, IFN-γ, IL-4, and IL-5 and decreases in IL-10 and IL-2; the reduction in the latter presumably reflects use of the cytokine by activated T cells in the culture. This result provided additional evidence for the ability of RO cells to enhance the maturation of poly(I:C)-treated DC. In contrast, reduced concentrations of most cytokines were observed in cultures stimulated with Treg-conditioned DC vs DC precultured in medium alone. This was apparent for IL-12, IL-6, IL-8, TNF-α, IL-10, IFN-γ, and IL-2. Therefore, these data indicated that pre-exposure of TLR-stimulated DC to Tregs largely suppressed cytokine production by both T cells and DC upon subsequent presentation of Ag to non-Tregs. Activated T cells express a variety of molecules that can influence the properties of DC. Hence, differences in expression of some of these molecules by Tregs vs non-Tregs could contribute to their differential effects on DC. We analyzed the expression of two activation-induced cell surface molecules that might be expected to contribute to T cell-mediated DC modulation, namely, LAG-3 and CD40L. LAG-3 is a high-affinity ligand for MHC class II, and a LAG-3Ig fusion protein has been shown to trigger signals in DC (43, 44). In the mouse, Tregs have been reported to express much higher levels of LAG-3 than non-Tregs following activation, and LAG-3 was shown to contribute to the suppressive activity of Tregs in vitro and in vivo (45). Conversely, CD40L is well recognized for its positive role in T cell DC cross-talk, and cross-linking CD40 on the surface of DC promotes maturation (14). We measured LAG-3 expression on Tregs, RO cells and RA cells that had been stimulated for 24 h with allogeneic DC (Fig. 5⇓A). All three populations of T cells were found to up-regulate LAG-3 to similar levels, although a slightly lower percentage of RA than RO or Tregs was LAG-3+ after activation (57% vs 70% and 80%, respectively). In contrast, a much lower percentage of Tregs than RO cells expressed CD40L after activation (Fig. 5⇓B). Thus, after activation, a high percentage of Tregs expresses LAG-3, whereas only a low proportion expresses CD40L. Differential expression of LAG-3 and CD154 by activated T cell subsets. 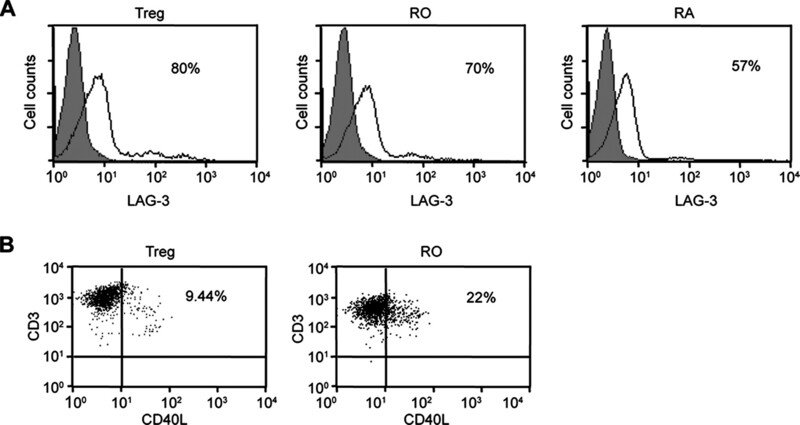 A, Cell surface expression of LAG-3 protein on Tregs (left panel), RO T cells (middle panel), or RA T cells (right panel) following activation with allogeneic DC for 24 h. The percentage of cells positive for the marker is indicated. B, Expression of CD154 (CD40L) on Tregs (left panel) and CD4+CD45RO+ T cells depleted of Tregs (right panel) following activation with allogeneic DC for 24 h.
To determine the role of specific molecules in regulating the outcome of DC-Treg interaction, we tested the effects of interventions that would modulate the activity of various receptor-ligand pairs in cocultures of Tregs and allogeneic DC (Fig. 6⇓, A and B). Given the high vs low expression of LAG-3 vs CD40L by activated Tregs, we assessed the effect of either blocking LAG-3 with anti-LAG-3 blocking Abs or adding an exogenous signal for CD40 cross-linking (soluble CD40L trimers). In addition, the effects of neutralizing Abs to CTLA-4, TGF-β, and IL-10, all of which have been reported to contribute to Treg activity in certain contexts, were examined. Immature DC were cocultured with allogeneic Tregs for 72 h, after which DC phenotype and the production of cytokines was compared in cultures receiving specific treatments or isotype control Abs. Contribution of multiple factors to the regulation of DC maturation by Tregs. Immature DC were cocultured with allogeneic Tregs at a 1:5 ratio for 72 h in the presence of isotype control mouse IgG, neutralizing anti-IL-10 (10 μg/ml), neutralizing anti-TGF-β (10 μg/ml)), blocking anti-CTLA-4 (10 μg/ml) or blocking anti-LAG-3 (20 μg/ml) mAbs, or recombinant CD40L trimers (5 μg/ml). A, DC were purified from DC-T cell cocultures by T cell depletion and analyzed for the expression of surface markers. B, Supernatants from the cocultures were analyzed for the indicated cytokines. Values represent the percent change in expression of the indicated surface marker or secretion of the indicated cytokine in the presence of blocking/neutralizing mAbs or CD40L as compared with isotype control IgG. The results are representative of two to three independent experiments. Remarkably, all treatments were found to affect the outcome of the DC-Treg coculture, with no single intervention completely reversing the Treg effects. Blocking of LAG-3 was found to inhibit up-regulation of CCR7, CXCR4, and HLA-DR and led to reductions in expression of CD80, CD86, IL-6, TNF-α, and IL-8. Therefore, expression of LAG-3 by activated Tregs appeared to be responsible for the positive effects of these cells on DC maturation. Conversely, the data indicated that a number of different mechanisms contributed to Treg-mediated inhibition of DC maturation. Addition of CD40L trimers promoted several maturation-associated changes, including increased CD80 and IL-8 expression and reduced CCR5 and CCR8 expression, suggesting that the poor expression of CD40L by activated Tregs may play a part in the weak ability of Tregs to induce these responses. Anti-TGF-β treatment led to large increases in CD80 and CD86 expression and a small increase in CCR7; this treatment also had an inhibitory effect on IL-10 production (Fig. 2⇑A). Addition of anti-CTLA-4 blocking Abs enhanced expression of CD80, CD86, IL-6, TNF-α, and IL-8, while neutralization of IL-10 led primarily to an increase in IL-6 production, with small increases in CD80 and TNF-α also observed. Overall, therefore, the data indicate that multiple mechanisms contribute to the generation of semimature DC by activated Tregs. Although DC are generally thought of as the controlling partner in the DC-T cell relationship, it is clear that feedback from T cells also affects DC function. As shown here, interaction with different types of T cells can endow DC with distinct properties. In particular, Tregs and conventional CD4+ T cells were found to exert contrasting effects on DC, with DC acquiring unique and intriguing characteristics following presentation of alloantigens (or self-Ags in experiments involving autologous Tregs, data not shown) to Tregs. Previous studies have shown that Tregs can inhibit some aspects of DC maturation (29, 30, 31, 32, 33), and this was also observed here. However, we demonstrated that Tregs also stimulate DC to exhibit changes typically associated with DC maturation; this included increased expression of MHC class II, CCR7, and CXCR4 and was accompanied by augmented responsiveness to the relevant chemokines. Therefore, Treg-conditioned DC can be described as being semimature. Skin-derived DC with similar properties to those exhibited by Treg-conditioned DC (CD80lowCD86lowMHC class IIhigh) have been shown to be present in mouse skin-draining lymph nodes under steady-state conditions, and these DC trigger abortive, tolerance-inducing responses upon Ag presentation to T cells (46). Constitutive migration of these semimature DC from skin into lymph nodes was shown to be CCR7 dependent, as has similar movement of DC from the intestinal lamina propria to mesenteric lymph nodes under noninflammatory conditions (47). These findings implied that CCR7 up-regulation could occur independently of DC maturation, but the stimulus for this response was unknown. Based on our data, one mechanism by which this could occur is through interaction of DC with Tregs. Interestingly, CCR8, which was up-regulated by Tregs but not non-Tregs, has also been implicated in the migration of monocyte-derived DC into lymph nodes (48). Because a significant proportion of Tregs found in human peripheral blood possess skin-homing capabilities (49), these cells have the potential to interact with skin resident DC under steady-state conditions. Therefore, Treg recognition of self-Ags presented by DC in peripheral tissues such as skin could be one trigger for “constitutive” DC migration to lymph nodes and might contribute to the maintenance of self-tolerance in this way. In addition to modulating the properties of immature DC, our data indicated that Tregs could inhibit DC maturation initiated by exposure to TLR ligands. This result appears to contrast with what has been observed for mouse bone marrow-derived DC, where pretreatment with maturation-inducing stimuli such as anti-CD40, LPS or CpG DNA was shown to render DC insensitive to the negative regulatory effects of Tregs (30). However, this could reflect a difference between mouse and human DC, since Tregs have been shown to inhibit the maturation of human monocyte-derived DC that were pre-exposed to anti-CD40 (32). In speculating about the physiological significance of Treg inhibition of TLR ligand-induced DC maturation, two issues should be taken into consideration. First, as shown here, the ratio of Tregs to non-Tregs recognizing Ag on DC was a key factor in determining the overall effect on DC maturation. This ratio could be affected by the relative presentation of self-protein-derived vs pathogen-derived peptides. Notably, DC have been shown to preferentially present, in association with MHC class II, Ags phagocytosed in combination with TLR ligands rather than Ags taken up without a TLR (50). Hence, DC exposed to infectious agents would be expected to be biased in presentation of pathogen-associated rather than self-Ags and the ratio of non-Tregs:Tregs recognizing Ags on these DC should be high. Treg down-modulation of DC maturation could provide a fail-safe mechanism, should presentation of self-Ags predominate on a TLR-stimulated DC, helping to prevent induction of autoimmunity during the context of infection. Second, in addition to their role in maintaining self-tolerance, Tregs have been shown to participate in the control of immune responses against infection, helping to avoid pathology that could be associated with excessive responses (51, 52, 53). Down-modulatory effects on DC maturation could contribute to this aspect of Treg function as well. We demonstrated that LAG-3 participates in Treg-induced up-regulation of CCR7 and CXCR4 on DC. Previous studies showed that treatment of DC with a soluble LAG-3Ig fusion protein induces increases in DC expression of costimulatory molecules and cytokines, including TNF-α and IL-12 (44, 54). Signaling for this response is triggered by high-affinity binding of LAG-3 to MHC class II (55). The more limited effects observed here for Treg-expressed LAG-3 than previously reported for the fusion protein could indicate differences in the signals initiated by cell-associated vs soluble LAG-3. Alternatively, many of the maturation-associated changes triggered by LAG-3 might have been negated by other inhibitory Treg effector mechanisms (see below). Notably, LAG-3 expression has been shown to play a role in the suppressive activity of mouse Tregs (45), which would seem to conflict with the ability of LAG-3 to induce DC maturation. However, cross-linking of LAG-3 on T cells has been shown to negatively regulate T cell activation (56, 57), suggesting that LAG-3 may directly affect Treg activity. Our data imply that LAG-3 could also contribute to Treg function in vivo through control of steady-state DC migration. In addition to LAG-3, a number of other molecules were shown to play a role in the modulation of DC properties by Tregs. 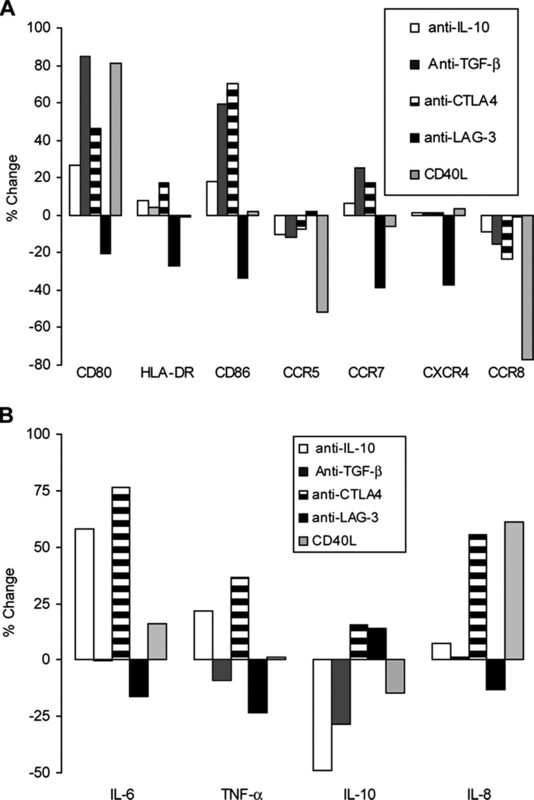 Direct evidence for the participation of IL-10, TGF-β, and CTLA-4 was provided by experiments using the relevant neutralizing Abs, while the ability of CD40L trimers to reverse some Treg effects suggested that low CD40L expression by activated Tregs contributes to their overall effects on DC. Interestingly, each factor was involved in mediating a unique combination of responses by the DC. For example, adding CD40L to DC-Treg cultures triggered up-regulation of CD80 (but not CD86) and down-regulation of CCR5 and CCR8, whereas blocking TGF-β led to increased expression of CD80 and CD86, but did not affect CCR5 or CCR8 expression. The data demonstrate that the Tregs differ from non-Tregs in their effects on DC due to both a deficiency in the expression of DC-activating factors (i.e., CD40L) and the expression molecules that actively suppress DC maturation (i.e., TGF-β, IL-10, CTLA-4). These findings further illustrate that DC maturation is not simply a coordinated, all-or-none response, but rather is a flexible process that is controlled at multiple levels. Hence, T cells expressing different combinations of cell surface molecules and cytokines have the potential to fine-tune the function of DC. In summary, we have shown that human Tregs modulate the properties of monocyte-derived DC, generating APC that are poor T cell stimulators with the capacity to migrate into the T cell areas of secondary lymphoid organs. The data have implications for steady-state migration of immature DC and for the mechanisms by which Tregs maintain self-tolerance. We are grateful to Sylvain Fisson for the help with cytokine analysis. This is publication number 124 from the Edward Jenner Institute for Vaccine Research. ↵1 This work was supported by grants from The Edward Jenner Institute for Vaccine Research, U.K. (to J.B. and D.F.T. ), and Institut National de la Santé et de la Recherche Médicale and Centre National de la Recherche Scientifique, France, and UPMC-Paris VI, France (to J.B. and S.V.K.). ↵3 Current address: Target Discovery, RI CEDD, GlaxoSmithKline, Gunnels Wood Road, Stevenage, U.K.
↵4 Abbreviations used in this paper: LAG-3, lymphocyte activation gene 3; DC, dendritic cell; CD40L, CD40 ligand; poly(I:C), polyinosinic polycytidylic acid; Tregs, regulatory T cell; FoxP3, forkhead box P3. Moser, M.. 2003. Dendritic cells in immunity and tolerance-do they display opposite functions?. Immunity 19: 5-8. Sozzani, S., P. Allavena, G. D’Amico, W. Luini, G. Bianchi, M. Kataura, T. Imai, O. Yoshie, R. Bonecchi, A. Mantovani. 1998. Differential regulation of chemokine receptors during dendritic cell maturation: a model for their trafficking properties. J. Immunol. 161: 1083-1086. Gunn, M. D., S. Kyuwa, C. Tam, T. Kakiuchi, A. Matsuzawa, L. T. Williams, H. Nakano. 1999. Mice lacking expression of secondary lymphoid organ chemokine have defects in lymphocyte homing and dendritic cell localization. J. Exp. Med. 189: 451-460. Kaisho, T., S. Akira. 2003. Regulation of dendritic cell function through Toll-like receptors. Curr. Mol. Med. 3: 759-771. Shi, Y., J. E. Evans, K. L. Rock. 2003. Molecular identification of a danger signal that alerts the immune system to dying cells. Nature 425: 460-461. Tough, D. F.. 2004. Type I interferon as a link between innate and adaptive immunity through dendritic cell stimulation. Leuk. Lymphoma 45: 257-264. Bennett, S. R. M., F. R. Carbone, F. Karamalis, R. A. Flavell, J. F. Miller, W. R. Heath. 1998. Help for cytotoxic-T-cell responses is mediated by CD40 signalling. Nature 393: 478-480. Alpan, O., E. Bachelder, E. Isil, H. Arnheiter, P. Matzinger. 2004. “Educated” dendritic cells act as messengers from memory to naive T helper cells. Nat. Immunol. 5: 615-622. Caux, C., C. Massacrier, B. Vanbervliet, B. Dubois, C. Van Kooten, I. Durand, J. Banchereau. 1994. 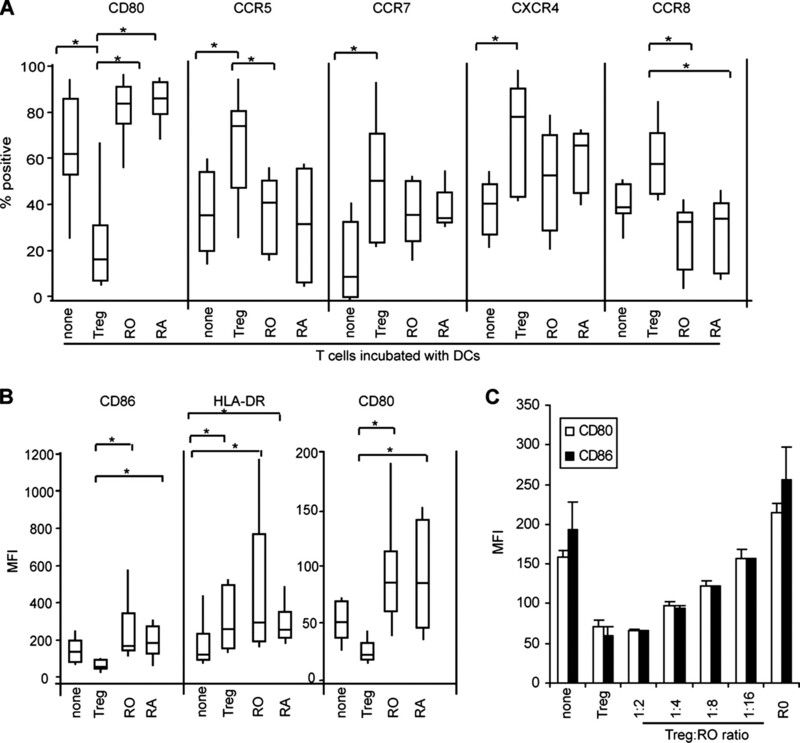 Activation of human dendritic cells through CD40 cross-linking. J. Exp. Med. 180: 1263-1272. Koch, F., U. Stanzl, P. Jennewein, K. Janke, C. Heufler, E. Kampgen, N. Romani, G. Schuler. 1996. High level IL-12 production by murine dendritic cells: upregulation via MHC class II and CD40 molecules and down-regulation by IL-10. J. Exp. Med. 184: 741-746. Josien, R., B. R. Wong, H. L., R. M. Steinman, and Y. Choi. 1999. TRANCE, a TNF family member, is differentially expressed on T cell subsets and induces cytokine production in dendritic cells. J. Immunol. 162: 2562–2568. Rescigno, M., V. Piguet, B. Valzasina, S. Lens, R. Zubler, L. French, V. Kindler, J. Tschopp, P. Ricciardi-Castagnoli. 2000. 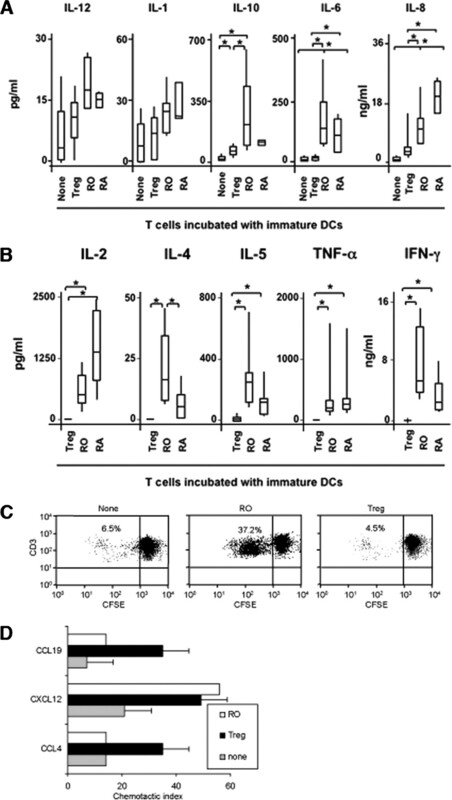 Fas engagement induces the maturation of dendritic cells (DCs), the release of interleukin (IL)-1β, and the production of interferon-γ in the absence of IL-12 during DC-T cell cognate interaction: a new role for Fas ligand in inflammatory responses. J. Exp. Med. 192: 1661-1668. Grohmann, U., C. Orabona, F. Fallarino, C. Vacca, F. Calcinaro, A. Falorni, P. Candeloro, M. L. Belladonna, R. Bianchi, M. C. Fioretti, P. Puccetti. 2002. CTLA-4-Ig regulates tryptophan catabolism in vivo. Nat. Immunol. 3: 1097-1101. Orabona, C., U. Grohmann, M. L. Belladonna, F. Fallarino, C. Vacca, R. Bianchi, S. Bozza, C. Volpi, B. L. Salomon, M. C. Fioretti, et al 2004. CD28 induces immunostimulatory signals in dendritic cells via CD80 and CD86. Nat. Immunol. 5: 1134-1142. Godfrey, V. L., J. E. Wilkinson, E. M. Rinchik, L. B. Russell. 1991. Fatal lymphoreticular disease in the scurfy (sf) mouse requires T cells that mature in a sf thymic environment: potential model for thymic education. Proc. Natl. Acad. Sci. USA 88: 5528-5532. Kriegel, M. A., T. Lohmann, C. Gabler, N. Blank, J. R. Kalden, H. M. Lorenz. 2004. Defective suppressor function of human CD4+CD25+ regulatory T cells in autoimmune polyglandular syndrome type II. J. Exp. Med. 199: 1285-1291. Lindley, S., C. M. Dayan, A. Bishop, B. O. Roep, M. Peakman, T. I. Tree. 2005. Defective suppressor function in CD4+CD25+ T-cells from patients with type 1 diabetes. Diabetes 54: 92-99. Cabarrocas, J., C. Cassan, F. Magnusson, E. Piaggio, L. Mars, J. Derbinski, B. Kyewski, D. A. Gross, B. L. Salomon, K. Khazaie, et al 2006. Foxp3+ CD25+ regulatory T cells specific for a neo-self-antigen develop at the double-positive thymic stage. Proc. Natl. Acad. Sci. USA 103: 8453-8458. Gangi, E., C. Vasu, D. Cheatem, B. S. Prabhakar. 2005. 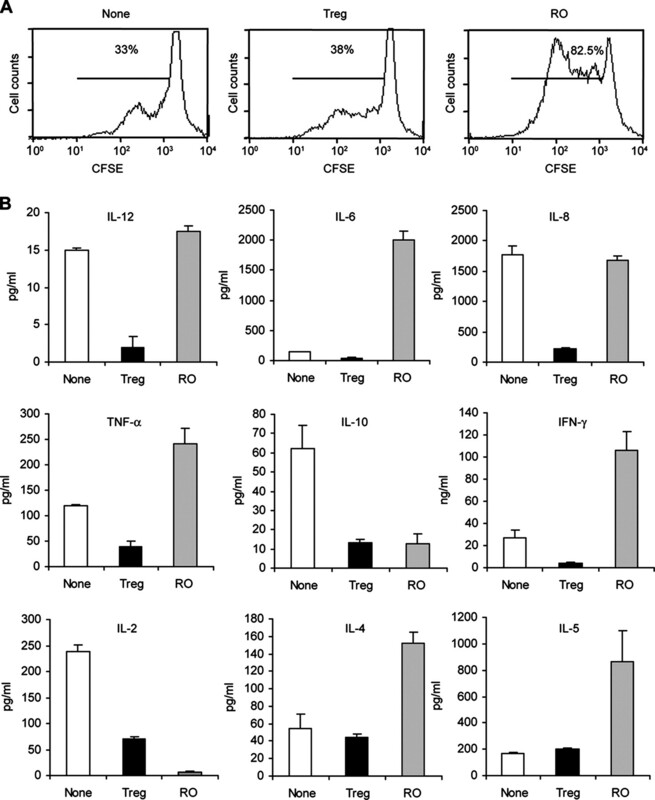 IL-10-producing CD4+CD25+ regulatory T cells play a critical role in granulocyte-macrophage colony-stimulating factor-induced suppression of experimental autoimmune thyroiditis. J. Immunol. 174: 7006-7013. Bluestone, J. A., Q. Tang. 2005. How do CD4+CD25+ regulatory T cells control autoimmunity?. Curr. Opin. Immunol. 17: 638-642. Tang, Q., J. Y. Adams, A. J. Tooley, M. Bi, B. T. Fife, P. Serra, P. Santamaria, R. M. Locksley, M. F. Krummel, J. A. Bluestone. 2006. Visualizing regulatory T cell control of autoimmune responses in nonobese diabetic mice. Nat. Immunol. 7: 83-92. Cederbom, L., H. Hall, F. Ivars. 2000. CD4+CD25+ regulatory T cells down-regulate co-stimulatory molecules on antigen-presenting cells. Eur. J. Immunol. 30: 1538-1543. Serra, P., A. Amrani, J. Yamanouchi, B. Han, S. Thiessen, T. Utsugi, J. Verdaguer, P. Santamaria. 2003. CD40 ligation releases immature dendritic cells form the control of regulatory CD4+CD25+ T cells. Immunity 19: 877-889. Fallarino, F., U. Grohmann, K. W. Hwang, C. Orabona, C. Vacca, R. Bianchi, M. L. Belladonna, M. C. Fioretti, M.-L. Alegre, P. Puccetti. 2003. Modulation of tryptophan catabolism by regulatory T cells. Nat. Immunol. 4: 1206-1212. Misra, N., J. Bayry, S. Lacroix-Desmazes, M. D. Kazatchkine, S. V. Kaveri. 2004. Cutting edge: human CD4+CD25+ T cells restrain the maturation and antigen-presenting function of dendritic cells. J. Immunol. 172: 4676-4680. Houot, R., I. Perrot, E. Garcia, I. Durand, S. Lebecque. 2006. Human CD4+CD25high regulatory T cells modulate myeloid but not plasmacytoid dendritic cells activation. J. Immunol. 176: 5293-5298. Ng, W. F., P. J. Duggan, F. Ponchel, G. Matarese, G. Lombardi, A. D. Edwards, J. D. Isaacs, R. Lechler. 2001. Human CD4+CD25+ cells: a naturally occurring population of regulatory T cells. Blood 98: 2736-2744. Taams, L. S., J. Smith, M. H. Rustin, M. Salmon, L. W. Poulter, A. N. Akbar. 2001. Human anergic/suppressive CD4+CD25+ T cells: a highly differentiated and apoptosis-prone population. Eur. J. Immunol. 31: 1122-1131. Stephens, L. A., C. Mottet, D. Mason, F. Powrie. 2001. Human CD4+CD25+ thymocytes and peripheral T cells have immune suppressive activity in vitro. Eur. J. Immunol. 31: 1247-1254. Dieckmann, D., H. Plottner, S. Berchtold, T. Berger, G. Schuler. 2001. Ex vivo isolation and characterization of CD4+CD25+ T cells with regulatory properties from human blood. J. Exp. Med. 193: 1303-1310. Levings, M. K., R. Sangregorio, M.-G. Roncarolo. 2001. Human CD25+CD4+ T regulatory cells suppress naive and memory T cell proliferation and can be expanded in vitro without loss of function. J. Exp. Med. 193: 1295-1301. Jonuleit, H., E. Schmitt, M. Stassen, A. Tuettenberg, J. Knop, A. H. Enk. 2001. Identification and functional characterization of human CD4+CD25+ T cells with regulatory properties isolated from peripheral blood. J. Exp. Med. 193: 1285-1294. Schulz, O., A. D. Edwards, M. Schito, J. Aliberti, S. Manickasingham, A. Sher, C. Reis e Sousa. 2000. CD40 triggering of heterodimeric IL-12 p70 production by dendritic cells in vivo requires a microbial priming signal. Immunity 13: 453-462. Cella, M., M. Salio, Y. Sakakibara, H. Langen, I. Julkunen, A. Lanzavecchia. 1999. Maturation, activation, and protection of dendritic cells induced by double-stranded RNA. J. Exp. Med. 189: 821-829. Baixeras, E., B. Huard, C. Miossec, S. Jitsukawa, M. Martin, T. Hercend, C. Auffray, F. Triebel, D. Piater-Tonneau. 1992. Characterization of the lymphocyte activation gene 3-encoded protein: a new ligand for human leukocyte antigen class II antigens. J. Exp. Med. 176: 327-337. Avice, M.-N., M. Sarfati, F. Triebel, G. Delespesse, C. E. Demeure. 1999. Lymphocyte activation gene-3, a MHC class II ligand expressed on activated T cells, stimulates TNF-α and IL-12 production by monocytes and dendritic cells. J. Immunol. 162: 2748-2753. Huang, C.-T., C. J. Workman, D. Flies, X. Pan, A. L. Marson, G. Zhou, E. L. Hipkiss, S. Ravi, J. Kowalski, H. I. Levitsky, et al 2004. Role of LAG-3 in regulatory T cells. Immunity 21: 503-513. Ohl, L., M. Mohaupt, N. Czeloth, G. Hintzen, Z. Kiafard, J. Zwirner, T. Blankenstein, G. Henning, R. Forster. 2004. CCR7 governs skin dendritic cell migration under inflammatory and steady-state conditions. Immunity 21: 279-288. Qu, C., E. W. Edwards, F. Tacke, V. Angeli, J. Llodra, G. Sanchez-Schmitz, A. Garin, N. S. Haque, W. Peters, N. van Rooijen, et al 2004. Role of CCR8 and other chemokine pathways in the migration of monocyte-derived dendritic cells to lymph nodes. J. Exp. Med. 200: 1231-1241. Iellem, A., L. Colantonio, D. D’Ambrosio. 2003. Skin- versus gut-skewed homing receptor expression and intrinsic CCR4 expression on human peripheral blood CD4+CD25+ suppressor T cells. Eur. J. Immunol. 33: 1488-1496. Blander, J. M., R. Medzhitov. 2006. Toll-dependent selection of microbial antigens for presentation by dendritic cells. Nature 440: 808-812. Belkaid, Y., C. A. Piccirillo, S. Mendez, E. M. Shevach, D. Sacks. 2002. CD4+CD25+ regulatory T cells control Leishmania major persistence and immunity. Nature 420: 502-507. Toka, F. N., S. Suvas, B. T. Rouse. 2004. CD4+ CD25+ T cells regulate vaccine-generated primary and memory CD8+ T-cell responses against herpes simplex virus type I. J. Virol. 78: 13082-13089. Andreae, S., F. Piras, N. Burdin, F. Triebel. 2002. Maturation and activation of dendritic cells induced by lymphocyte activation gene-3 (CD223). J. Immunol. 168: 3874-3880. Andreae, S., S. Buisson, F. Triebel. 2003. MHC class II signal transduction in human dendritic cells induced by a natural ligand, the LAG-3 protein (CD223). Blood 102: 2130-2137. Hannier, S., M. Tournier, G. Bismuth, F. Triebel. 1998. CD3/TCR complex-associated LAG-3 molecules inhibit CD3/TCR signaling. J. Immunol. 161: 4058-4065. Workman, C. J., K. J. Dugger, D. A. A. Vignali. 2002. Cutting edge: molecular analysis of the negative regulatory function of lymphocyte activation gene-3. J. Immunol. 169: 5392-5395.